刘天, 黄继贵, 郝海波, 李斌, 刘漫, 刘力, 夏世国, 毛安禄. 湖北省荆州市2017年肾综合征出血热流行特征及宿主动物调查[J]. 中国媒介生物学及控制杂志, 2018, 29(6): 609-612. LIU Tian, HUANG Ji-gui, HAO Hai-bo, LI Bin, LIU Man, LIU Li, XIA Shi-guo, MAO An-lu. Epidemic situation of hemorrhagic fever with renal syndrome and investigation of the host animals in Jingzhou city of Hubei province in 2017[J]. Chin J Vector Biol & Control, 2018, 29(6): 609-612. Corresponding author: HUANG Ji-gui, Email: jzcrbs@163.com. Abstract: Objective To study the epidemic situation of hemorrhagic fever with renal syndrome (HFRS) and the distribution and virus-carrying situation of host animals in 2017, to provide a scientific basis for the monitoring and prevention of HFRS. Methods Descriptive epidemiological analysis was conducted on the survey data. The investigation of host animals was carried out in high incidence counties (cities and districts). Chi-square test and Fisher's exact test were used to compare the rates. Results A total of 124 HFRS cases including four deaths were reported, the incidence rate was 2.17/100 000. The top three regions of incidence were Jiangling county (6.94/100 000), Jianli county (3.03/100 000) and Honghu city (2.59/100 000). Two peak seasons were observed in spring (May-June) and winter (November-December). The majority of the patients are young males and middle-aged farmers. The investigation of host animals showed that the average density of rodent was 5.28%, the rate of virus carrier of rodent was 12.44%, the average index of virus harborage was 0.08. The average density of rodent was 5.73% indoors. The Norway rat (Rattus norvegicus), not carrying Hantavirus, was the predominant species. 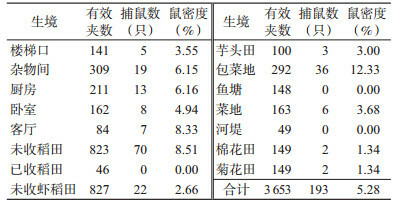 In the field, the average density of rodent was 5.13%, the rate of virus carrier of rodent was 17.02%, the average index of virus carriage was 0.09. Apodemus agrarius, the reservoir of HNTV, was the predominant species in general. But R. norvegicus was the predominant species in Jianli county and was trapped in paddy field with raising craw fish and rice alternately. Conclusion Human and rodent epidemic situation are severe in Jingzhou city. Apodemus agrarius is still the main reservoir host of HFRS in Jingzhou city. The relevant departments should pay attention to the R. norvegicus, which migrated from indoor to the field. 白晶晶, 王晓南, 刘力, 等. 2001-2015年湖北省肾综合征出血热流行病学特征分析[J]. 现代预防医学, 2016, 43(20): 3655-3660.